The Preston Focus, Iris and Zoom unit is well established as the workhorse of all the wireless remote focus units. The HU3 is the last word in rugged, reliable LCS for digital cinema use. It integrates its 30 channel 2.4GHz wireless link into a splash-resistant housing. Weather sealed tactile switches are used throughout. The integrated microwave antenna is protected from impact. The iris control uses a unique non contact technology to eliminate the need for sliding seals. 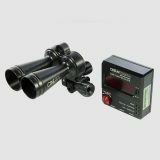 It offers "Lens Mapping" of standard and customised lens sets via five pre-marked focus scale rings. These rings differ in their minimum focus marks which range from 9" (.35m) to 6' (2m). The on-board lens library holds data for 100+ lenses, freeing the assistant from having to mark up individual rings.